With revenues of over $300 million, Vector Security is a giant in the alarm industry. But the company also is one of the nation's largest home automation installation firms, with offerings that include IoT thermostats, video doorbells and Amazon Alexa. The #5 company on the SDM 100 list of highest-revenue alarm dealers, Vector has 29 branch locations in 12 states, plus a healthy network of authorized dealers. Now Vector has a retail shop, too. 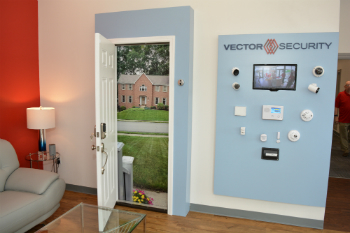 Recently, Vector hosted a grand opening for a new brick-and-mortar outlet, located in Canfield, Ohio, that offers customers the opportunity to touch, feel and demo security and smart home solutions offered by the company. A "Customer Experience Area" features products such as security control panels, indoor and outdoor video cameras, doorbell cameras, lights, thermostats and other smart home devices. Real windows and doors show how sensors and contacts work and how alarms can be triggered. Customers can also use a store-provided iPad in the store’s “living room” and experience the protection, comfort, and convenience of controlling smart home functions using the Vector Security mobile app, according to an announcement. Customers can also demo voice control using an Amazon Echo Dot to see how Vector Security “skills” can be used to control their security system, as well as lights, locks, and thermostats. indoor and outdoor video cameras, video doorbells, IoT lights, thermostats and other smart home devices. Those who wish to purchase equipment can place an order on site and schedule installation, or make an in-home appointment with a sales representative. “The storefront adds a new dimension of visibility for our brand … and we hope that people from the community will come join the celebration,” says Art Miller, vice president, marketing. “We are very excited to bring this storefront concept to the Youngstown/Boardman area,” states Gordon Zeiler, general manager, Vector Security. This article was originally published at CEPro on 08/17/2018. It was added to IoTplaybook or last modified on 08/17/2018.